For an island that’s roughly just 25 miles long and 15 miles wide, Islay is home to quite a few inland, freshwater lakes…or, more appropriately, lochs. The largest of these is Loch Gorm which is located in the northeast corner of the island, barely a mile from the Atlantic Ocean and, if you’ve got a really good arm, just a stone’s throw from the Kilchoman Distillery. From what I’ve read, the countryside around Loch Gorm is rife with wild life, and compared to the rest of Islay, relatively flat. The Loch has certainly seen its fair share of history, most notably in the form of a decisive 16th century battle between the MacLean and MacDonald clans who were always too busy fighting to enjoy the flat-ish landscape and abundant wildlife. These days, clan warfare is pretty much non-existent near Loch Gorm, and the only fighting happening on a regular basis is between fishermen and the reportedly beautiful little Brown Trout (Salmo Trutta) that energetically populate the waters. 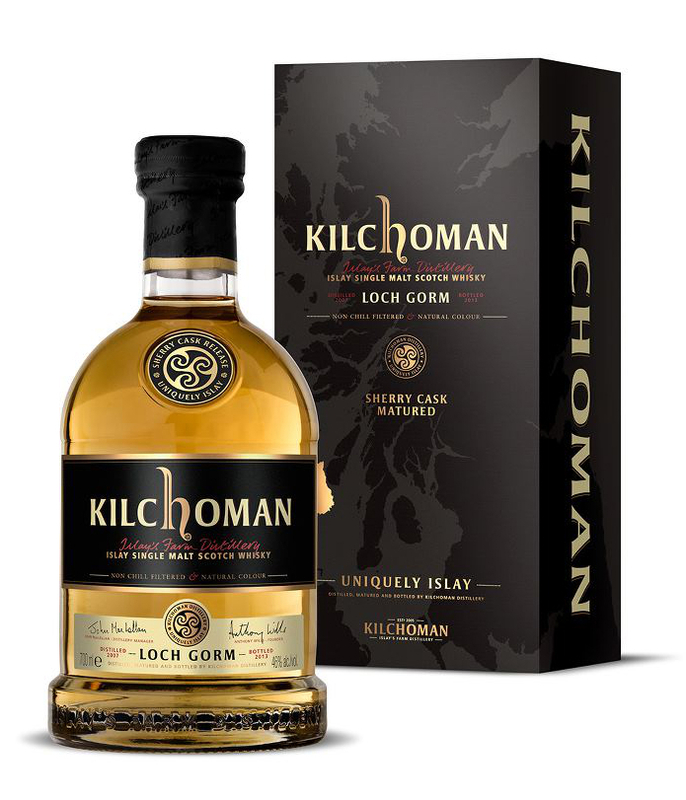 In honor of the lake, Kilchoman debuted their Loch Gorm expression in April of 2013. At the moment, it is the only whisky in Kilchoman’s range that has been matured solely in ex-sherry casks. This year’s 10,000 bottle-strong release of Loch Gorm was aged for five years in ex-Oloroso sherry butts and then finished for six weeks in smaller ex-Oloroso hogsheads to add a bit more complexity and color to the whisky. Kilchoman’s intent is to have the Loch Gorm and Machir Bay releases make up their “core” range, though each expression will vary yearly as more mature stocks become available to this impressive, young distillery. The Nose: Delicious. Very much Kilchoman with the peat and smoke front and center, but this is more rounded or integrated than previous releases. Underneath the briny, rubbery, slightly antiseptic peat lie syrupy notes of lemon curd, poached pear and stewed raisins along with subtler hints of macerated tart cherries and grape must. There are spices in all that savory peat as well, cloves in glazed ham and black pepper-rubbed steak. The smoke is less ashy than other Kilchoman releases as well, more like a dry smoke from a BBQ. The Palate: Wow. A thinly oily mouthfeel with more baked, sweet, dark fruits initially, cherries and raisins again, alongside dark chocolate and toffee. The peat swells early, relents a bit to let more tinned fruit and spice come through, cloves, allspice, and black pepper, and then combines with more chocolate and malt in a savory-sweet, dry wood-smoke gallop to the finish. The Finish: Medium-long and mouth-watering…It’s hard to type because I keep reaching for the glass. Not as ashy as I usually think of Kilchoman being, full of more clove, pepper, dried fruits, and dry wood smoke. Thoughts: Man, oh man, fairly stunning stuff. I’ve been very impressed with the many Kilchomans I’ve tried so far, but none have wowed me as much as this Loch Gorm release. I’ve had an inkling that I preferred sherry malts from this young distillery, and this one proves it without a doubt. It’s still robust and youthful, but some of that sharp-edged ashy-ness is rounded off, the fruit notes given even more depth, and there’s more of a savory quality. The influence of the sherry casks is strong but it’s integrated so well that the whole dram progresses with great balance and complexity. Tasting this in the brooding gloaming, a subtle nip in the air…yup, Winter is coming, and this will be a perfect dram for it. Highly recommended. Well this certainly sounds delicious! I wonder if they’ll be at the Jewbilee on Thursday. I will definitely be on the lookout. Me likey Kilchoman! According to their pour list, Kilchoman will be there, not sure if they’ll have the Loch Gorm tho’. You’re going? Wish I could be there, one day, I’ll make an East Coast trip to see youse guys.